“It is obvious that the All Progressives Congress (APC) federal government has failed to protect Nigerians, if its electoral promises is anything to go by and one wonders the basis for the party to applaud President Muhammadu Buhari’s claim of bringing back home those innocent Dapchi Girls that ought not to have been abducted in the first place if not for the government’s laxity. 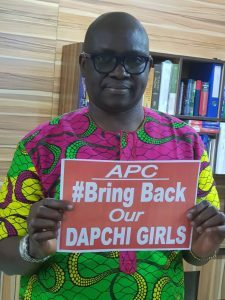 “Most importantly, that the abduction and return of the girls took place without resistance is a sign that the APC led federal government has lost the war against insurgency, the basis for which it came to power. It is also a clear indication that Nigerians can no longer depend on the clueless government for their safety. “The way and manner the Dapchi girls were abducted and returned is a clear demonstration that the federal government is fooling itself and not Nigerians as the whole process is shrouded in secrecy, raising more questions than answers. “The removal of military checkpoints in Dapchi ahead of the abduction, as confirmed by Governor of Yobe State, Ibrahim Geidam, clearly shows the complicity of the federal government and some individuals profiting from the whole saga. “Despite security alerts by the locals, the military looked the other way, which necessitated the damning report by the Amnesty International. “To the amazement of Nigerians, 24 hours after, the abductors brought back the girls. I believe the true story of this Dapchi abduction will be told one day. “I wish to identify with the families of the returned Dapchi girls and sympathize with those of the deceased.